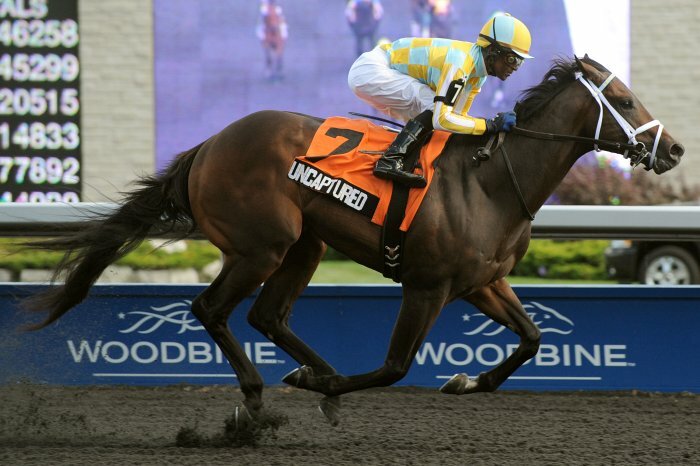 Uncaptured, a multiple stakes-winning juvenile based at Woodbine Racetrack, was made the 30-1 future book favourite this morning for the 2013 Kentucky Derby, by the Wynn casino in Las Vegas. The two-year-old Lion Heart-Captivating colt, bred in Ontario by William D. Graham and trained by Woodbine's leading conditioner Mark Casse, is undefeated in four starts at Woodbine this year, including scores in the Clarendon, Vandal and Swynford Stakes. The trainer has saddled two previous Kentucky Derby starters: Prospective (18th in the 2011 Derby) and Seaside Retreat (10th in the 2006 Kentucky Derby). Casse, a four-time Sovereign Award winner as Canada’s leading trainer, is cautiously optimistic about having Uncaptured named as the early favourite for the 2013 edition of the 'Run For The Roses', to be held Saturday May 4 at Churchill Downs, in Kentucky. "It's nice to be the future book favourite, now we just have to make it to the Derby and be the favourite," said Casse. "There's a lot of sweating before then." The top-ranked colt is joined in the top 10 of the Wynn Las Vegas future book by a pair of horses with experience at Woodbine. Jocosity (85-1), bred in Ontario by Nick Andrews, placed twice at Woodbine for trainer Todd Pletcher and owner Let’s Go Stable before breaking his maiden at Saratoga. Tesseron (85-1), a Kentucky-bred son of Tapit trained by Josie Carroll for the Donver Stables of Alberta-based Vern and Donna Dubinsky, broke his maiden at first asking on September 3, at Woodbine. Only two Canadian-bred horses have won the Kentucky Derby - - Northern Dancer in 1964 and Sunny’s Halo in 1983. In 2009, Mine That Bird, a Kentucky-bred gelding, captured the Derby after earning the nod as Canada’s Champion Two-Year-Old Male, on the back of four Woodbine wins. Uncaptured was consigned by Four Star Sales at the 2011 September Keeneland Yearling Sales and purchased by Casse, as agent, for $290,000, for owner John C. Oxley. "He was one of the best-looking yearlings I've ever seen," recalled Casse. "He's a beautiful horse. I thought he was the entire package and then for him to be an Ontario-bred was the icing on the cake. I've been buying horses now for over 30 years and there are certain things I look for and he had every one of them. I like a good neck and shoulder. On a scale of one to 10, he has a 10 neck and shoulder, a really nice hind leg and he has some stretch to him." Casse, who is still seeking his first Queen's Plate and Kentucky Derby score, admits that a horse capable of winning a Classic is always in his sights. "We're always looking at horses we think can get a mile and a quarter for the Queen's Plate or Kentucky Derby and we thought he fit," said Casse. "He was the entire package from looks to pedigree." Following a brief freshening, Uncaptured returned in style with a 5 1/2-length romp in the restricted $150,000 Clarendon Stakes, dusting fellow Derby hopeful Jocosity. Uncaptured followed up his Clarendon romp with a one-length score in the $150,000 Vandal Stakes, on July 28. In the Vandal, a six-furlong sprint, Uncaptured broke sharply, commanded the lead by the half and cruised home under regular rider Patrick Husbands. In his most recent effort, Uncaptured was sent to post as the odds-on favourite in the open $168,000 Swynford Stakes, a seven-furlong 'Poly' sprint and romped by 3 1/4-lengths under a hand ride. "He was going seven-eighths for the first time and he left (the starting gate) aggressively and by the time he came out of the chute he relaxed," said Husbands following the Swynford score. "He's just a little class horse." Uncaptured is set to make his next start on Sunday, October 7 in the Grade 3 Grey Stakes, a 1/16-mile route over the main track at Woodbine. The Grey is a key event for horses pointing at the 2013 Kentucky Derby as Churchill Downs recently adopted a system that awards the 20 starting berths in the Kentucky Derby to horses that have earned points as the top four finishers in 36 stakes leading up to the ‘First Saturday in May,’ in favour of the previous system that was based on graded-stakes earnings. "The Grey, with the new point system, has meaning to it because it comes with Derby points," explained Casse. "It's a big deal and it's important to us." The Grey will also mark Uncaptured's first two-turn test. "He's been very impressive so far. Distance isn't going to be a problem," said Casse. "There will come a day when he has to dig deep and show us what he's made of. I just hope that day doesn't come for awhile." If Uncaptured impresses in the Grey, it's possible that the colt would make his final two-year-old start in the Grade 1, $2-million Breeders' Cup Juvenile, a 1 1/16-mile jaunt over the Santa Anita dirt on November 3. With all four of Uncaptured's starts coming over the Woodbine 'Poly' thus far, Casse isn't worried about how his horse will handle the dirt, at either the World Championships in November or 227 days from now at the Kentucky Derby. "It doesn't concern me," said Casse. "He's a beautiful moving horse. He has a wonderful stride and I've said all along horses that like Polytrack like Churchill Downs." When Uncaptured's season wraps up, he will ship to Palm Meadows in Florida and begin preparations for a three-year-old campaign on the dirt. "He'll have his transition to dirt down at Palm Meadows," said Casse. “Hopefully, he stays happy and healthy." For now though, Casse is content to enjoy what has been a spectacular campaign from his Canadian horse with three stakes wins and $333,660 in earnings. "It's an honour and it's a first," said Casse, of the future book nod. "I'm happy and I'm proud - - who would have thought a Canadian horse would be the future book favourite for the Derby?"